Riding in Iceland is a unique experience – an opportunity to ride strong, willing horses over exciting and adventurous terrain. Riding an Icelandic horse is not only tremendous fun, it is also a great way to experience the natural beauty of Iceland; snow topped mountains, the largest glacier in Europe, volcanoes, thundering waterfalls and striking lunar landscapes. The Icelandic horse is a pure-bred descendant of those brought to Iceland by the Vikings over a thousand years ago. Horses remain an important part of Icelandic culture; they are used on remote farms to round up livestock and are still the best means of getting around in many parts of the island. Although small, the Icelandic is a powerful horse and has no difficulty carrying someone weighing 100kgs. This tour was nominated by the Sunday Times as one of the 10 best trails in the world. We ride along soft riding tracks ideal for “tölting”, the unique extra gait of the Icelandic Horse. The first day we spend in Jökulsárgljúfur National Park and visit both Dettifoss Waterfall and Ásbyrgi Canyon. From rich green pastureland we head towards the Gæsafjöll Mountains and spend a night in a mountain cabin at Theistareykir. Through an area scarred with cracks and fissures from earthquakes and volcanic activity the route takes us to Lake Mývatn where bubbling mud pools and eerie lava formations are a reminder of the powerful energy right beneath our feet. We have the opportunity to bathe in the warm geothermal water of the outdoor pool at the Mývatn Nature Baths. The next two days take us through Laxárdalur Valley and from there we continue across Reykjaheiði heath towards the coast and back to Bjarnastaðir Farm. After this amazing tour in an ever-changing landscape we can let our cares float away in the hot tub before sitting down to a hearty farewell dinner at the farm. Much of the riding is at a tölt, which can be fast so you need to be a confident rider able to adapt to different riding styles. General fitness is as important as riding experience due to the long hours in the saddle. If you know how to ride a horse using English riding style you should have no problems riding an Icelandic horse. Western-style riders should not experience any difficulties adjusting to the Icelandic way of riding either. 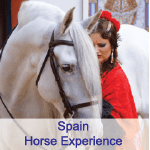 The guides will take some time at the beginning of each tour to explain the correct way to saddle the horse, mount it and how to ride the different gaits. They will carefully explain how and when to ride “tölt”, the special gait of the Icelandic horse. The Icelandic Horse breed is best known for its four-beat smooth gait, the “tölt”, which is very comfortable for the rider, especially on a longer tour. Riding an Icelandic horse in its native habitat is an authentic riding experience. Herding along free running horses is the traditional way of travelling in Iceland, since horses are changed at least once a day on longer tours. You will get to ride a variety of horses. The wonders of Lake Mývatn and Europe‘s largest waterfall, Dettifoss. The North of Iceland is known for its spectacular natural sights and diverse landscape. Our tour goes from Bjarnastaðir Farm near Húsavík to the Lake Mývatn area, famous for its volcanic features and rich birdlife. Ásbyrgi Canyon, Dettifoss, Europe’s largest waterfall, and the strange rock formations at Hljóðaklettar are just some of the gems of nature we´ll be seeing on this amazing tour. Departure from pick up points in Reykjavik www.busstop.is to the Domestic Airport for the flight to Húsavík and transfer to Bjarnastaðir Farm. Pick up between 06:30 – 07:30. Please dress already in riding clothes and bring your passport or other identification for your domestic flight. At Bjarnastaðir, we have lunch and start our ride with a short introduction to the Icelandic horse and its special gaits. We start the day with an exciting sightseeing tour by bus. We begin with a nice hot bath in Jarðböð, an outdoor lagoon with geothermal water. We saddle up again and head of through a black sand desert along the colourful Laxárdalur valley with the glittering Salmon River Laxá in the middle. A true day of contrasts in the ever changing Icelandic nature. We stop at the very special Hraunsrétt – made of lava. We ride to Skógarhlíð, where we leave the horses tonight. (Approx. 30 km). Due to weather and other anomalies we reserve the right to alter the itinerary if necessary. You will stay at various family run guest houses during this trip. Price is based shared rooms and you will require a sleeping bag. Bathrooms are shared. During the ride full board is provided with a mix of cosy, simple guesthouses & farmhouses. The food is lovely home cooked Icelandic food, consisting of soups & stews, fish & lamb, with healthy breakfasts & lunches. Vegetarian meals and other meal requests are available if requested when booking. All riders make their own packed lunch from the breakfast table. Rain wear, water bottle, saddle bag are provided. It is compulsory to wear a riding helmet. Hot tubs are available at some guest houses so this gives the riders a chance to relax after a long days riding. There are a wide variety of other rides available like Sheep round ups throughout the summer. If you do not see availability for your preferred dates, please do contact us. There might have been a cancellation or we might have a slightly different ride in Iceland which would appeal to you. Depending on your flight times, you will need at least one night in Reykjavik after your ride. Cost: €2159.00 euros Low season and €2290.00 euros High season. We use the ANZ sell rate to convert from euro to the Australian dollar. Full board during the ride is provided. The menu consists of a large breakfast and traditional Icelandic meals (fish or lamb). All riders make their own picnic lunch form the breakfast table. Alcoholic beverages are not included in the tour price and are hard to get in the highlands. They can be bought at a reasonable price in the duty free store at Keflavik Airport on arrival. Pick up Reykjavik and transfer to Domestic Airport for the flight to Húsavík and transfer to Bjarnastaðir Farm. During the ride you will enjoy sightseeing in the local area and their is normally a hot tub to relax in most nights depending on the location.